Has the MacBook Air finally come of age with this new 11-inch version? Are their brains behind the MacBook Airs beauty? Although an excellent technological achievement, the MacBook Air has previously struggled to find its niche in the Apple notebook range. It was too expensive to compete with the low-end MacBook, and not powerful enough to replace the higher-specced MacBook Pros. It was light, beautiful and desirable, but unnecessary. 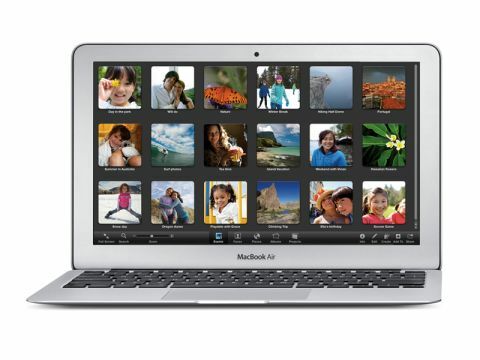 The late 2010 release of the MacBook Air represents a major update for Apple's ultra-thin notebook. The form factor has had a major overhaul, and there's now four off-the-shelf MacBook Air configurations instead of two. Interestingly, two of the MacBook Airs have 11-inch screens, making them the smallest Apple notebooks since the Powerbook 5300 Series back in the mid-'90s. The two 11-inch models use 1.4GHz Intel Core 2 Duo processors and cost £849 and £999 respectively, while the two higher-end MacBook Airs once again use 13-inch screens, run on 1.86 GHz Core 2 Duo processors and cost £1,099 and £1,349. The new MacBook Airs benefit from several technologies developed for the iPad. While the last generation of MacBook Air offered a high-end flash storage model and a cheaper release that used a hard drive, the entire MacBook Air range has now gone over to solid state drives. In fact, the two 11-inch MacBook Airs and the two 13-inch releases are differentiated only in the amount of solid state storage they have. The 11-inch MacBook Airs have 64GB and 128GB respectively, while the 13-inch models offer 128GB and 256GB. But there's more to the new MacBook Airs than a switch to solid state storage. The new notebooks have an interesting new form factor, extended battery life and although processor speeds are nothing to write home about, new graphics technologies give them a power that belies their on-paper clock speeds. But can the late 2010 revision reinvent the MacBook Air as a realistic alternative to a MacBook or MacBook Pro, or is it still no more than a useful second notebook?